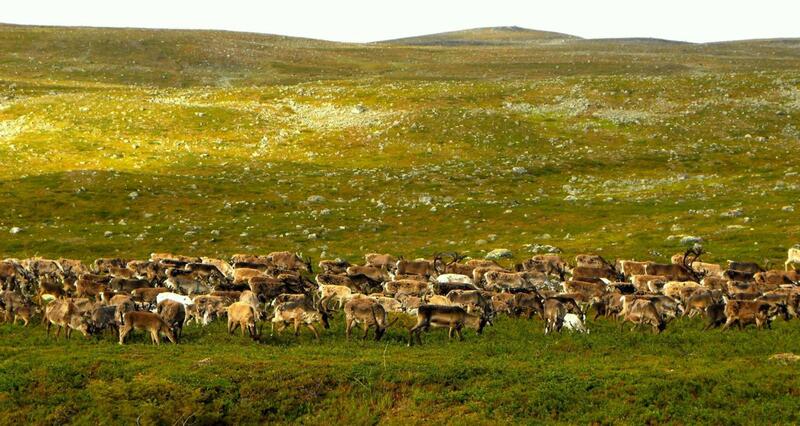 "By eating tall and wide-leaved plants, reindeer can increase light availability and thus allow more plant species to co-exist and benefit from warmer conditions," says Elina Kaarlejärvi, post-doctoral researcher at Umeå University, who led the study. Earlier studies suggest that tundra plant diversity will decrease in response to a warmer climate. However, it is important to know whether the response depends on the abundance of grazing animals, particularly reindeer, voles and lemmings, which are very common in tundra ecosystems. Researchers at Umeå University in Sweden, and Oulu University in Finland, tested this through experimental warming of vegetation on tundra meadows with and without reindeer and voles. "We found that the warming increased the number of species in plots that were grazed, because it enabled small tundra plants to appear and grow there. But when we fenced reindeer, voles and lemmings out, vegetation became denser and the light was limited. As a result, many small and slowly-growing plant species were lost," says Elina Kaarlejärvi. The researchers investigated what species appeared and disappeared from the study plots over the course of five years. By doing so, they could test what kinds of species were most affected by warming and grazing. The newly published results suggest that mammalian herbivores could generally help protect diversity in warmer climates by preventing losses of small and slowly-growing species. The study was performed in Kilpisjärvi in northwest Finland, where the research team tested the importance of grazing animals, warming and nutrient availability by combining small greenhouses that increased the summer temperature by 1-2 degrees Celsius, small fences that excluded reindeer, voles and lemmings, as well as by use of fertilization. Elina Kaarlejärvi is a post-doctoral researcher funded by the Swedish Research Council, VR. She is affiliated to the Climate Impacts Research Centre (CIRC) at Umeå University, but she currently works at Vrije Universiteit Brussel in Belgium. The research team includes Anu Eskelinen, academy research fellow at the University of Oulu. She currently works at the Helmholtz Centre for Environmental Research and the German Centre for Integrative Biodiversity Research in Germany, and Johan Olofsson, associate professor at the Department of Ecology and Environmental Science and at CIRC at Umeå University.